Classic crafted design conducive to relaxation these Recycled Plastic Adirondack Chaise Lounges perfectly appropriate for enjoying a cool beverage, taking a quite nap or even settling in with a good book. 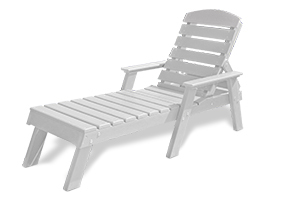 The advantages of recycled plastic are diverse and make it ideally suited for constructing Adirondack Lounges. Starting with its capacity for moisture-resistance, the benefit is that it won't rot, warp, crack, splinter, or support bacterial growth. It also means no sanding, painting or resealing is required and it will still look new, season after season. Post-consumer waste such as milk jugs, pop bottles and plastic bags are the main ingredients	in these Pensacola Style Adirondack Chaise Lounges, and to top it all off, the lounges themselves are also	completely recyclable. Help reduce the pollution of landfills with Adirondack Chaise Lounges that can be enjoyed for generations to come.